Last edited by Stoltec Moto; 09-09-2016 at 09:29 PM. Reminder for those who missed it: these batteries will ship during the first week in October. Please plan accordingly before purchasing! Q: Can I use a regular battery charge? For clarity, this is not the relocated, smaller sized battery used in the Stoltec FZ-09 that was located in the seat tray at one time? We're running the deal on the OEM sized batteries. If you wanted the smaller battery, we could work out pricing for you. However, that installation required some specialized bracketry and a whole lot of patience. Maybe the Russian hackers can do something about why every package we ever sent to Russia ends up being an insurance claim. Russian Post lost every single thing we've sent. I have been looking at battery replacements for some time- and this looks like a good deal. Just have some questions. How long will it last if there IS parasitic drain- which includes a GPS tracker, heated grips and a alarm system? The stock battery keeps dying if I dont ride it for a day or two. I have to use a jump starter- and that's the second question- can you jump start these? Also, description says "Excellent for every day use in bikes up to 600cc"...does the FZ require a larger battery? 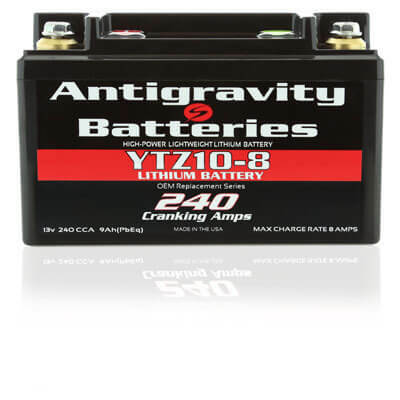 Well, the capacity on the YTZ10-8 is 9 Ah. So, it really depends on how much of a draw you have. Since that capacity is right about the same as the stock battery, I'm betting you'll get about the same life out of a charge. Without knowing specifics, I'd guess your alarm or GPS tracker is sucking up the juice. Might make sense to disconnect one for a few days and monitor the situation. There's a few options there. I've handled them all myself and am impressed. CCA refers to the 'cold cranking amps'. This reflects how well the battery will run the starter. The 'power' you're referring to is capacity - as measured in Ah. Lithium batteries need a bit of a warm up when around freezing. Typically, turning the bike on and running the fuel pump (along with marker lights, turn signals, etc. will be enough draw to bring the battery to life within a few seconds. The colder it gets, the more time you give it. Turn on your heated grips while you suit up for a minute and you should be golden. Of course, YMMV. I've used this same battery without issue on our FZ-09 and the same one is going into the FZ-10 this week. This battery actually has more cold cranking amps than the stock Yuasa (240 vs 190) and similar capacity (Yamaha specs 8.6 Ah, but all bikes I've seen have 9.1 Ah; the Antigravity YTZ10-8 is 9 Ah). We wouldn't sell something that would knowing cause an issue for you but like anything else...what you need and how you use it may be different. But like you, I generally ride my machines all year round. I'm good for about 20F-100F. We get more ice on our colder roads than you get in the city, but all that to say our use cases are fairly similar in that regard. Useful info- we ride the same but not sure we have the same amount of demands off the battery! As for jumpstarts, I was referring to the portable ones. I actually had the AntiGravity Microstart XP1 (I believe it was Made in China) which I bought last year. Just after the measly 1 year warranty ran out, so did the jumpstart where the battery randomly swelled and cracked the case open! (i had barely charge it 5 times & never overcharged). Seems like it's a common issue- AG would only give a new piece for 75% of cost. Instead, this time went with someone who gives 3 years warranty at more than half the cost. In the end they all seem the same with same issues. That experience made me a little wary of Antigravity though. Anywho, I looked at this same battery too- but I hope someone who draws as much power as I do can shed light on how well it can withstand all that draw= need the alarm & tracker- esp after it has been stolen once already! Usually battery drain is not an issue if I ride every day and in the winters, the bike probably does not get ridden 7- 10 days max at a time. On a side note, can a larger capacity battery be actually fitted into the bike in the same space- just in case I decide to go that direction?